skates adorned with giant blue pom poms with bells on them, I didn’t have a care in the world. Yes, the pom pom can do that to a girl. I dare you to try and say pom pom and not smile – it’s impossible. 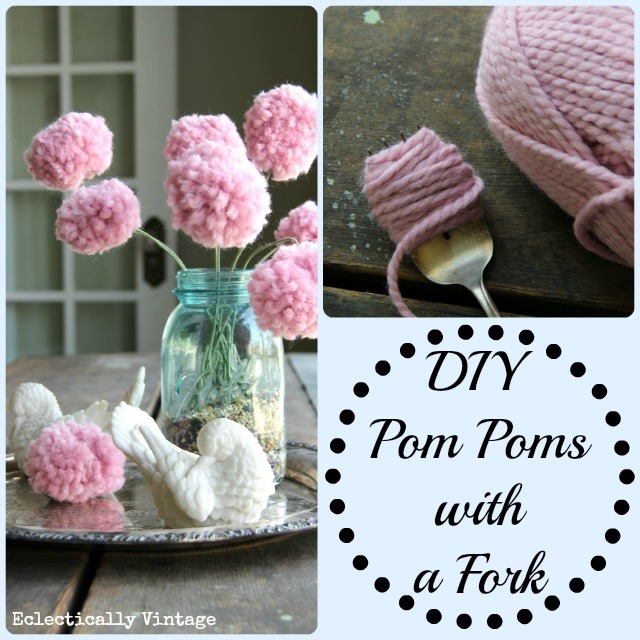 So let’s learn how to make pom poms – with a fork! 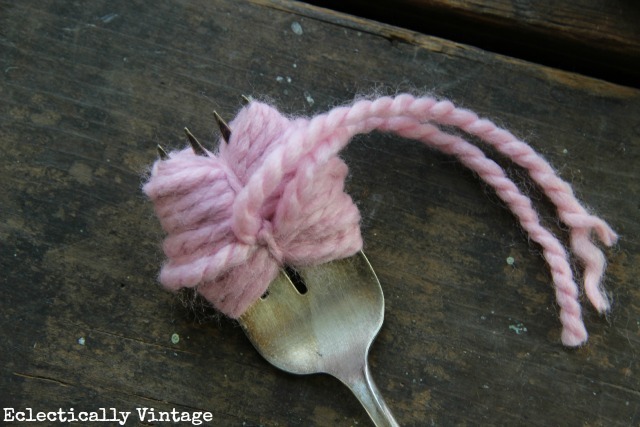 1) Wrap yarn around fork around 50-60 times then cut yarn (I used large serving forks to make big pom poms). 2) Cut a small piece of yarn and bring it through the center fork tines, underneath and up through the bottom of the center tine. Knot it tightly. 3) Remove yarn from fork and cut through each side of the pom pom loops as shown. 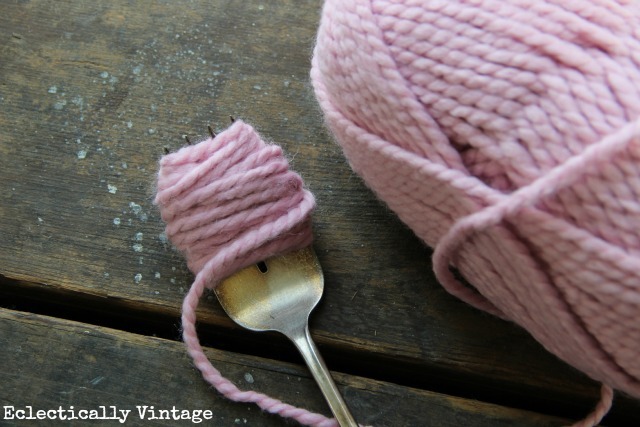 4) Cut off excess yarn and give it a good trim. Fluff with fingers. 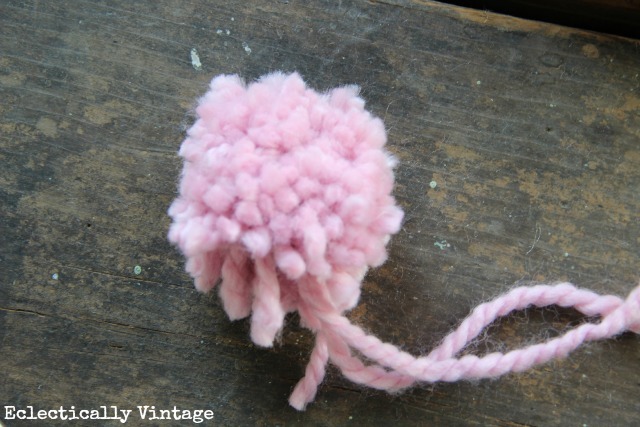 5) Simply poke florist wire through the pom pom (no gluing needed – and easily removable). 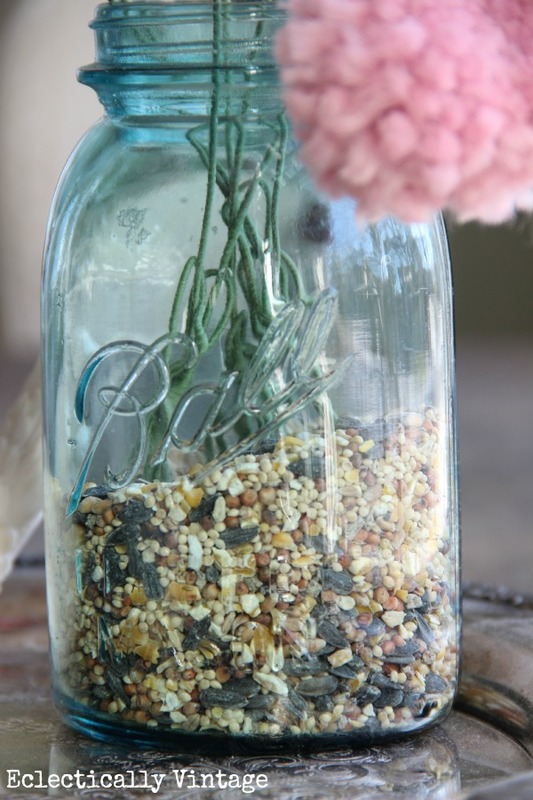 6) Arrange your flowers in a mason jar, set on your table and watch everyone smile. So imagine what making your own pom pom bouquet can do for a girl – it’s almost too good to be true! The pom pom just might be the thing to bring about world peace. Don’t have a big enough fork to make nice big pom poms – you can alway use one of these pom pom makers too. Oh, and check out my fabulously fun Burlap Bunny Table Runner – with pom pom tails! How sweet is that!! Gotta make me some. Those are so cute. I just may have to get my crafting on. Kelly, these are so adorable! I have a huge yard stash and I just bet I have a color that will work in my daughter’s room (13 years old) that we’ve been working on for a couple of months!!! I can’t wait to make these for her!! Love this project! It’s perfect for my 14-year-old daughter to keep her busy! SUPER cute! love the color and i think this is a perfect winter look! Very cute. And so simple! I used to have pom poms on my roller skates when I was in Jr High! I thought I was the stuff! =) These would make really cute toppers for a package. Thanks for sharing the fun this morning! Have a great Monday! How adorable! They remind me of Horton Hears a Who! Yup, you made me smile too! Cute as a button! Thanks for the inspiration! Those pom pom flowers are adorable! I had pom pom’s on my skates, too! Now my girls want to wear them in their hair! What is old is new again! I have to admit, I was not a pom pom girl…however I was a roller skater, but my Mom never got me the pom poms:( These are stinkin cute Kelly. Great tut too! Love, love, love them! With the fork, just ingenious! So Cute! I love how they are so fluffy and how they look in the jar. These are adorable…and I really did have pom poms on my ice skates when I was about 14. A million years ago! Love the idea of using a fork. Easy peasy! I so miss my skates with their hot pink pom-poms! These are too adorable…totally copying! These are so pretty! 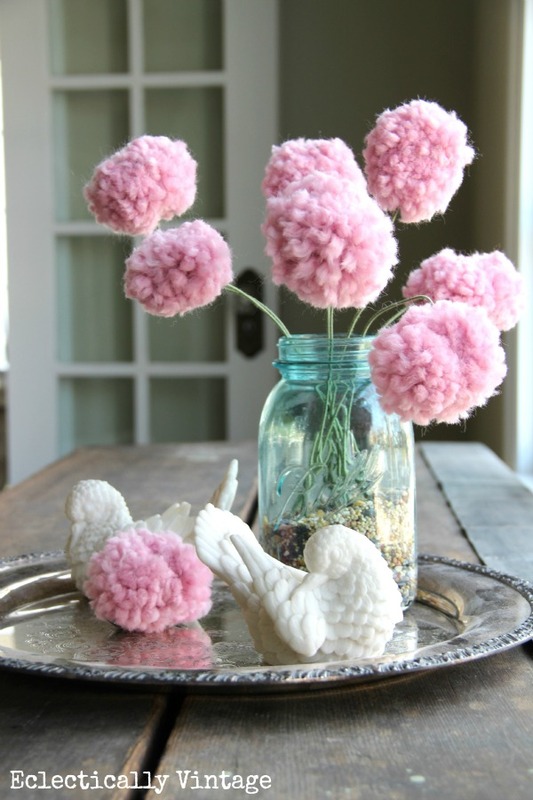 I have pom poms on my list of things to try making! I can’t believe they are so easy. OK this has to be one of the cutest projects, seriously love this!!! I think I am doing something wrong!! When I take it off of the fork an cut the loops and try to fluff it you can still see the middle where I tied it!!! : ( what am I doing wrong!! Help!!!!! Hi Cindy – I would wrap it more and fluff it more – maybe try using a thicker yarn too. Let me know if that works. This is like a trip back to 6th grade. Skating, shooting the duck, the Satin Jacket that my mother would never buy me because she deemed them “tacky”. Ergh, still want one. The Pom Poms!! I forgot all about these. How fun to rediscover. Pinning this, then hopefully making myself a bouquet as I watch the rest of Downton Abbey tonight! Ingenious and almost attractive as you in your satin jacket, I bet. Perhaps I could come up with a craft to replicate the time I walked around the playground fence with my seventies chain belt slung around my hips as I sported a shift dress my mom had made, hoping Ricky Butler (the cutest blond kid in school) would notice me. Ha! Not to say that I didn’t have many a roller rink moments. Those were the days. We made pom poms when we cheered for pee wee football. I love the softness of the yarn you used. “It’s so FLUFFYYYYYY!” And you are a tribute to finding ways to make the past relevant at any age. Bravo! I love them! Great idea and beautiful colors….and forks! I will try to do them. Besos and Happy 2013 Kelly! Love these! 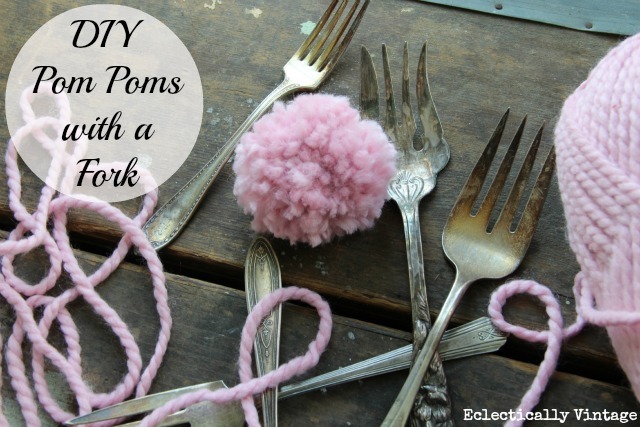 I’ve made pom poms before, but never with a fork. You’re a genius! That is the cutest project ever! I love your pom poms and what a great idea using a fork. I would love for you to come and share this at my Winter Blues Wednesday party going on right now. Hope to see you there. I had white pom poms….I had to be monochromatic!! !…From skates to a vase…how very creative!! !….Super, super cute!!! this is so stinkin’ cute! This is the easiest tutorial for pom poms I’ve ever seen! Thanks for sharing, Kelly! I’ll be saving this so I don’t forget…something that happens all to often. I’ve seen the pom pom wreaths and didn’t love them, but the bouquet is super cute! Great idea! I’m really digging pom poms. I made my first pom pom for a finger knit garland that I made for a white elephant pressie (http://ngnrdgrl.wordpress.com/2013/01/07/pinspired-finger-knit-garland-with-pom-poms/). Now when I see pom poms shared at link parties, I am all, “oooOOOO!” I’ve been wanting to make more, but not really sure what to do with them. This is a great idea!!! Pinning this! Awesome technique, Kelly! I always just wind yarn around my hand.This looks much easier! Thanks for sharing! Love them! I totally need a pom pom bouquet! These are so sweet. And with a fork no less. I must try this. Okay, I just shared these everywhere, because I love them, but also as a reminder that I must make pompons! Soon. Lovely! Pom poms = world peace!!!! I definitely agree! Loving your pink bouquet in the blue mason jar, I’d say that = happy! Those are so cute! Thank you for sharing! I love these, so so pretty and totally smile worthy! Thanks for sharing! I LOVE this idea! So cute and something I’d actually put out at my house 😉 Just pinned it!! Love these! They are super cute and a great color! I love, love, love these!! Seriously Kelly, you are so cute. These are too cute! I love the colored mason jars too! I’m so loving pompoms lately! Pinning. Love these, I am going to pin this for sure. Could you tell me what kind of yarn you used, it looks so thick and soft? Thanks for sharing!! How did I miss these? They are adorable! When the grandgirls are here, we’re going to make these! There is a Roller Rama here in my town of Huntington. Is that where you are from? I just love these! So fun! So cute! I had to come on over from Hometalk and tell you! I just got a big bag of yarn (no smell 🙂 from the Goodwill. I am definitely going to do this! super cute! I had a set of pom pom makers as a teenager and for a while had a pom pom canopie over my bed! Your poms and pictures are beautiful. I love the pink yarn you used and the mason jar you displayed them in. Really well done. Love the vignette with the Alabaster Doves on the Silver Tray. Those Doves were carved in Italy & part of the original line of Home Interiors started in 1957 by Mary Crowley. I sold a ton of those using cute stories of how they could be the mood setter in the home. If you were in lovey dove mood you snuggled them up close together for hubby to get the hint. However if he had ruffled your feathers you can turn them tail to tail so he would get the message. LOL! We’d get lots of laughs at those stories at parties. Alabaster is very porous so you never submerge them in water. One lady had put them in an aquarium & wondered why they kept getting smaller & smaller. Best way to clean them is with a toothbrush & cornmeal! And then wipe them off with a damp cloth. I wish I had kept a set just for ol’ time sake! 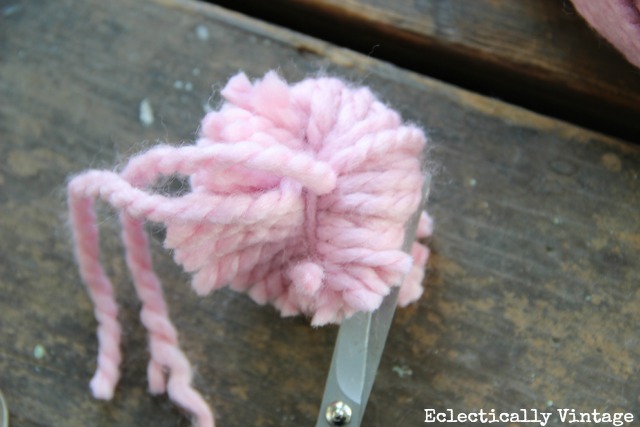 Cut your tying yarn before wrapping the pompom and slide it thru the tines. Wrap it around the handle and proceed with wrapping the pompom. No more forcing the tie thru the tines after wrapping. If you wrap a bit loosely, and use a fork that you don’t mind scratching (even plastic), you can slide the scissors on each side to cut before taking it off the fork. Thanks for the great idea and instructions! Thanks for the tip Becky!